Cleaning your home during Spring mainly can reduce the spread of disease especially if you have small children and make the environment more comfortable as you wait for the Chinese New Year Festival. However, overusing toxic chemicals can be just as dangerous as the dirt that may be your house. Therefore, finding a balance between having a clean house and reducing harmful toxins in your home is necessary. A simple way to establish whether you have found the balance or not is checking on the odor. Unpleasant odors are traditionally associated with a dirty environment in your home, but they can also mean that you have overused the chemicals that are toxic in nature which may prove to be fatal for you and your family. In order to eliminate odors without necessarily using these chemicals use natural products that are equally effective. Many people simply assume that the cleaning products they have at home are safe but you should be cautious and always buy your cleaning products made by well-known manufacturers. Since Springtime in Singapore entails cleaning your house from top to bottom there could be a tendency of using the same rag to clean different dirt infested areas of the house. This practice not only spreads germs from one place to another but it also spreads dirt making your hard work go down the drain. A good practice is to have multiple rags to clean different rooms and surfaces and avoid reusing the same water to clean different rooms. Once you are done clean and thoroughly wash your rags and dry them. When it comes to using of the sponge, thoroughly rinse it with water before you got the surface. After the cleaning, you should make sure that you leave the sponge completely dry after use as it can be a breeding ground for germs. In Singapore there many stores that have a variety of synthetic sponges that are safe for you to use. Many households prefer to clean their household items with a cleaning sponge because they are absorbent and protect any surface. There are many cleaning products in the market today. While you can find a specialized supplier in a range of cleaning products, there are other suppliers who know the market with just one product. This is subjective for the provider and how the market predicts. With so many products on the market, most customers are in a dilemma about what they buy and what they do not buy. Since every current product has competitive pricing and important advertising strategies, it is increasingly difficult to judge a product. Due to the dilemma don’t buy multiple cleaning products and mix them with an intention of improving their effectiveness. On a matter of fact, you may be creating a very toxic concoction that may react with surfaces you clean. It is advisable to stick with one and natural house cleaning product when cleaning a particular surface room or upholstery. If you have no allergic reaction, you can choose a bagless vacuum cleaner. Although emptying the dust can be a bit messy, it does not always have to be replaced. However, if you are allergic to dust, make sure you get a vacuum that comes with disposable bags. Of course, you should always have plenty of bags in stock since you will be disposing of them regularly. If you or someone in your family is allergic to dust then you should use a good vacuum with a functional filtration system. If the dust leaks back into the air, the affected person may have asthma or shortness of breath. It is always better to choose a HEPA filter with sealed compartments. HEPA filters absorb dust, mold and other common irritants that can trigger allergies. If you have a pet at home, it is recommended that you obtain a highly absorbent cleanser with a HEPA filter that cleans off some fur or other debris brought by the animals. Spring cleaning is a time everybody in the family has to participate in getting everything ready before the New Year Chinese festival. Cleaning during Springtime is all about teamwork since there a lot of places that need the attention. If you don’t have enough workforce you can simply contact a professional cleaning company in Singapore. These professionals work with the right tools and equipment that are up to date which effectively and quickly get your home sparkly clean. Doing all those chores may dampen your spirits and efforts since you have to tackle a lot within a short time. It is important to clean your home in sections, which proves to be practical and requires less effort. After the room by room or section by section, the cleaning process is considered the best and most effective way to reduce your anxiety and ensure proper cleaning. To clean your home efficiently, you need to know where to start and finish certain areas. This saves time and helps with the most effective cleaning of your home. For the best results, you do not have to focus on running, you need to focus on specific areas such as the kitchen, bathroom, bedroom and living room to plan the cleaning of your home. This helps to avoid revisions, save time and reduce the risk of more clutter. When cleaning a specific area, you should concentrate and follow the golden rule of starting “from top to bottom and from left to right” for you to achieve the best results. If you want to have a clean and tidy home, it is important that you cleanse regularly, vacuum cleaners and wait regularly for the best results. You can also rely on the house’s professional cleaning service to clean your kitchen, clean the bedroom and clean the bathroom for a deep clean and hygienic living space. 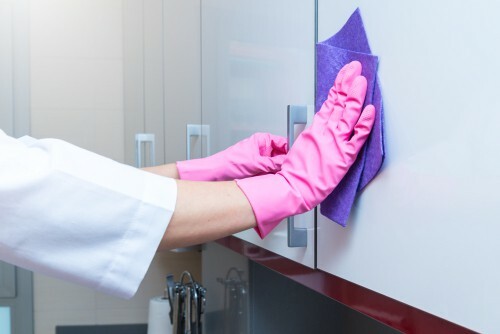 Most professional cleaners believe that the kitchen, bathroom and living room are the breeding ground for bacteria, microbes, and other harmful germs. To remove germs from home, you need to use the best cleaning solutions that are more effective and more environmentally friendly. Clean sinks, faucets, toilet seats, floors, kitchen countertops, etc. with the right tools and a safe cleaning solution. A proper and organized home will improve your mood and give you complete peace of mind. It is assumed that a complete cleaning service, which is carried out by an experienced cleaning specialist will give the best results and create a warm and inviting space for you to enjoy Spring.